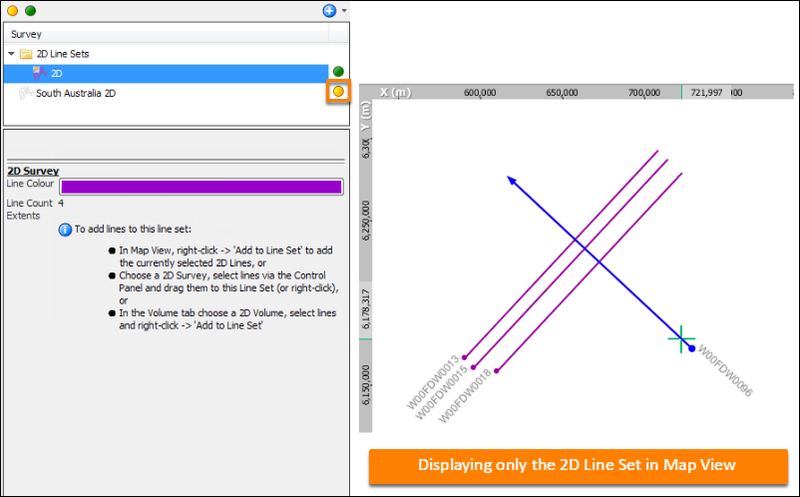 After creating a 2D line set (see Creating a 2D Line Set), you can change the colour of the lines to differentiate from other sets or any highlighted lines. You can also disable the original survey to only display the line set in Map View. In the Survey tab, click on the 2D Line Set to display the Details Panel. 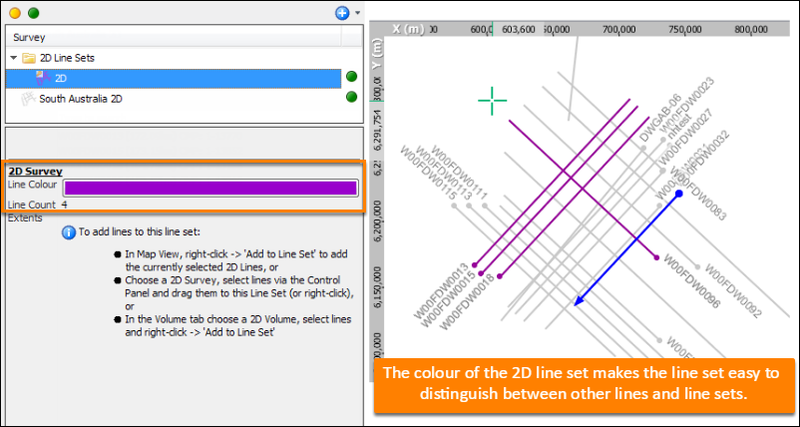 Change the colour of the 2D lines in Map View by clicking on the colour bar at 2D Survey. To disable the original survey and only display the line set in Map View, click on the green circle beside the survey in the Survey tab. The circle will turn to amber to signify that the survey has been disabled. In the Map View, only the lines in the 2D Line Set will now be visible. You can turn off or increase/decrease the size of all 2D line names in the survey. In Map View, open the Display tab. Under the General section, untick the 2D Line Names check box to hide all the names of the 2D lines. You can also adjust the font size of the names by increasing or decreasing the number in the box. Tip: You can also hide selected (blue) 2D lines by deselecting the 2D Selected Lines check box. Navigation markers displayed in the Map View show the location of the IL/CL being viewed. The bold section of the navigation markers show the zoomed-in area being viewed. Update the zoomed area in Map View by hovering the mouse over the zoomed area and moving it in the inline or crossline direction. The section view will automatically update. Note: Hold shift + click and drag will move the entire IL/CL. 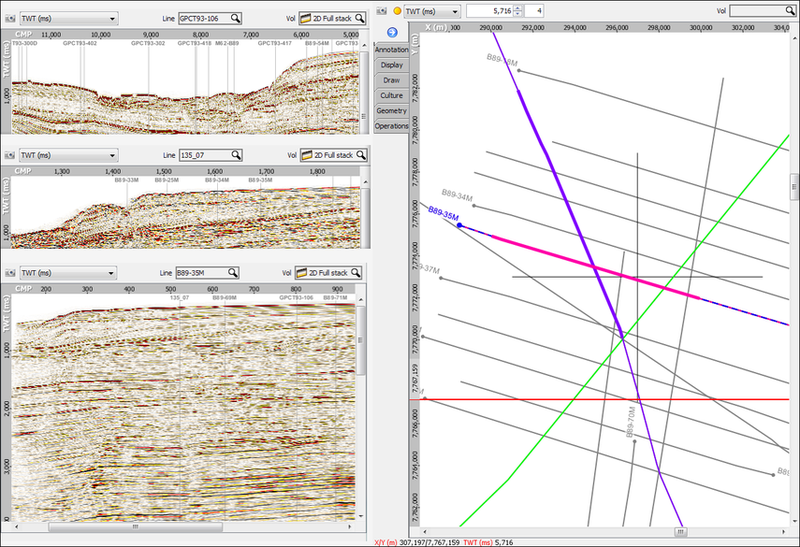 Each 2D line is colour coded based on the colour assigned to the 2D Line View. Every 2D Line View can have link/unlink display attributes, such as Line Selection (see Linking Multiple Windows). The main 2D line will be a dashed blue colour, plus the colour of the 2D Line window. Move a 2D line, hold shift and drag the line to another line. This can be done separately for each 2D line or collectively for linked lines.